Go to this site, and post the first character you generate! I did it but then remembered that I don't know how to screenshot . 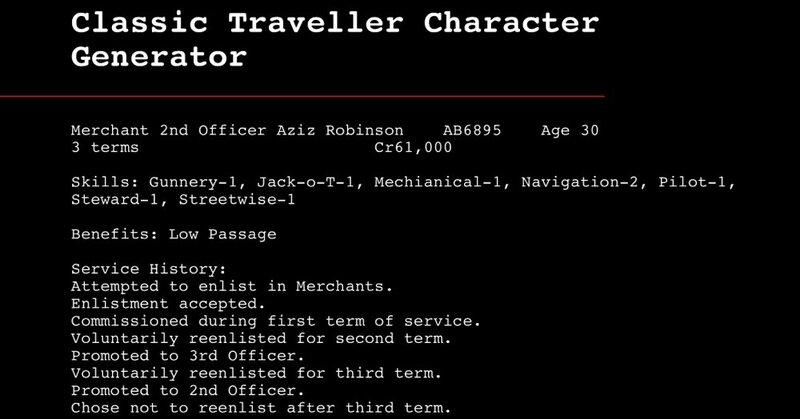 Go to this site, and part the first character you generate! Part the character? With a cutlass, maybe? Well, my character had obviously heard about survival rolls and decided to get out as soon as possible. Attempted to enlist in Merchants. Commissioned during first term of service. Manditory reenlistment for second term. 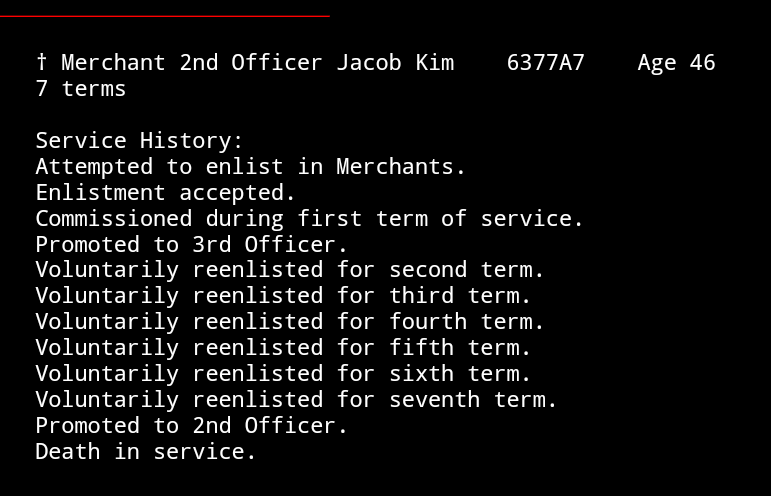 Denied reenlistment after second term. no promotions then effectively kicked out of the merchants. I wonder what he elfed up? Attempted to enlist in Scouts. Probably a rockslide started by an unfriendly alien. Voluntarily reenlisted for second term. Voluntarily reenlisted for third term. Voluntarily reenlisted for fourth term. Denied reenlistment after fourth term. Attempted to enlist in Marines. Attempted to enlist in Army. Voluntarily reenlisted for fifth term. Denied reenlistment after fifth term. It appears that scouts have a pretty high mortality rate. I will give it a whirl. Maybe dodgy on a mobile. Dodgy it was. Hard to capture the whole thing. I reduced the resolution by half before posting it. ~1450x755 pixels. Why does it spell mechanical as mechianical? British spelling? Chose not to reenlist after first term. It took about~20 tries to get a scout that lived. Chose not to reenlist after third term. I've been playing D&D for over a decade now, and while there are a lot of great terrain solutions for dungeon crawls, I always felt there wasn't a great option when it came to generic random encounters, like setting up camp for the night. As a player, and a DM these random encounters often lacked meaning because they didn't have the same customization as encounters core to the campaign. So I decided to come up with a solution that was simple for a DM, and that made the encounter more meaningful for the player. I made a 36” by 24” iron rubber base on which you can layer smaller magnetic terrain. For a DM It takes second to throw some trees, rocks, and other terrain down to make the scenario unique. Then your players can quickly arrange their tents, wagons and other equipment in thoughtful ways that make random encounters more meaningful. There is 44 pieces of double sided magnetic terrain, so you can run pretty much any random encounter in the wilderness that you can think of. If this sounds like something you'd use check out the kickstarter for more information. I love feedback so please let me know what you think of the product. I designed it how I would want to use it, so if you feel like something's lacking, or should be changes Id like to know. Shereul the Dead god Where is this money going? $12, 000 - If we reach this stretch goal we will publish a book of pregenerated characters for play in PDF. These will be characters suitable for conventions, one shots or even for your gaming group if someone should not want to go through the time of making up a character or if they are new to your group. Release date TBD. $15,000 - If we reach this stretch goal we will produce an adventure booklet for Spellmonger in PDF. This should contain about four separate but linked adventures for your Spellmonger gaming. Release date TBD. Legendary Games makes a massive mythic rules upgrade with the amazing Mythic Character Codex & Mythic Monster Manual II for Pathfinder! Mythic Mania II encompasses two books, and incorporates mythic material for hardbacks like the Advanced Class Guide, Forest Kingdom Campaign Compendium, Horror Adventures, Occult Adventures, Ultimate Intrigue, and Ultimate Wilderness, as well as potentially adding in more material from the Adventurer’s Guide, Monster Codex, Planar Adventures, Villain Codex, Book of the Damned, Pirate Campaign Compendium, and more! Mythic Character Codex – Three new mythic paths - the bound, mystic, and reluctant hero - along with over a thousand new mythic path abilities, hybrid class features, feats, spells, magic items, and more! A little more than 48 hours left for this one, I think it looks really cool. Kamigakari: God Hunters is a tabletop role-playing game set in modern-day Japan that combines centuries of Japanese mythology with a modern-day setting and urban fantasy action. You play as a God Hunter, a being wielding supernatural strength, magical abilities, and reality-warping spiritual powers. Your mission is to protect an unsuspecting populace from evil beings known as Aramitama, and to prevent the supernatural from leaking into the public eye. Originally, the game was released in Japan by Arclight Games on November 2013 as Legendary Arms RPG Kamigakari, to great popularity. In January 2017, a text-only fan translation appeared on the internet, exposing Kamigakari to the attention of English-speaking RPG fans world wide, and creating a thriving fanbase that continues to grow to this day! Serpent Sea Games is a team of experienced RPG translation and development professionals, including the creator of the fan translation, who have licensed Kamigakari from the creators at Arclight Games for publication in English and want to bring the game officially to Western audiences. But we need your help to bring this book into existence! The world of Kamigakari features a distinctly seinen action anime and style to it. With crazy abilities and flashy powers, it's an over-the-top world where you can battle kaijus, giant robots, gods and demons all under the same umbrella. The system is designed to keep interactions as simple and intuitive as possible, for an easy pick-up-and-play. Kamigakari splits its play up into "scenes", which are short, episodic and will often split the focus onto individual players. It's a different experience compared to western systems that often assume the party is always together, which allows for more varied and engaging character focus and development. So what is a God Hunter? A God Hunter is a person who, through one means or another, has gained supernatural powers by possessing a shard of a legendary weapon, relic, suit of armor, or maybe even the crystallized soul of a legendary hero. These powers can be anything from a master of the sword or magic, transforming hero, a living avatar of flame, or the ultimate hacker. Instead of a familiar class-based system, Kamigakari uses its own character generation called Styles, which lets you mix and match your power sets to create a gun-slinging samurai, a chainsaw-wielding magical girl, a hacker who codes his magic into existence, or a hunter who stalks his victims through the shadows. And it's not just limited to your class: weapons and gear are utilized under the Arms system, a mechanic where a base weapon is upgraded over time by using materials or spending gold. Two basic swords, in the hands of two different god hunters, can end up very different weapons after extensive modification! An average God Hunter on a normal day. Does being a God Hunter mean that you hunt gods? Of course it does! With concepts rooted in Shintoism and traditional Japanese folklore, a God Hunter is tasked with tracking down dangerous beings known as Aramitama - a dark god that is born and grows in power by devouring the souls of its victims. Aramitama come in many forms - from recognizable Japanese icons like oni and tengu, mythical beings like the Pegasus or Griffin, to eldritch monstrosities made of gnashing teeth and glowing orbs. Upon defeating an Aramitama, God Hunters can use their remains to create stronger Regalia - magical weapons and equipment, in order to face even even more powerful Aramitama. It's not just a fun gameplay loop, either: These creatures threaten the sanctity of innocents and the world in their lust to reach their ultimate form, the Avatar of Ruin, a true god of destruction capable of ending the world. It's up to the God Hunters to prevent that! An Aramitama awakens. Kamigakari utilizes the unique Numen Dice pool. Numen Dice are resource wherein you roll a set of dice and use it to pay for abilities or change the outcome of a roll. There's many ways change, swap and spend dice. Players must be careful how they manage their Numen Pool to both survive the battle and save the perfect set of Numen Dice to activate their ultimate abilities! We'd like to support this game far into the future, and plan on translating and releasing supplements if financially viable. Arclight Games has also requested the creation of original content exclusive to the western release, but that can probably wait until we have a few expansion books finished, we're only mentioning it now in the interests of full transparency. Forests in fantasy roleplaying games are dark places, full of secrets. With this project, we bring the Old Margreve to the 5th Edition of the world's most popular RPG. The Margreve is an ancient, enchanted forest that defends itself from those who come to cut its timber, poach its creatures, or steal its magic. Within its borders the Old Ways are strong, the word of the druids carries great weight, and griffons, dragons, and stranger creatures nest and hunt, undisturbed by humans, dwarves, or other lordlings. 2) a Margreve Player's Guide softcover book of new player options, including new races, druid and ranger subclasses and tools, backgrounds, and forest-themed spells. 3) (if unlocked) a set of thick cardboard standups, the Margreve Pawns, which are similar to those created for Tome of Beastsand the Creature Codex. Here is a small sample of what that would look like; we anticipate producing 150 to 200 pawns (depending on stretch goals). Together with some book-expanding stretch goals, this project provides new deep-forest character options and a full sequence of adventures to draw adventurers into the wilderness and keep them on their toes. Initially we debated this as a softcover adventure collection, but we soon realized that it was large enough and compelling enough to make into a hardcover volume playable in 5th Edition fantasy campaigns, together with a player supplement. Why not go big? Kobold Press is doing something a little different with its digital offerings this time. We're putting our effort into the two print books, and possibly a custom set of pawns—and digitally, full sets of virtual tabletop (VTT) files. That means that we'll have the Old Margreve adventures and source material available on Roll20 and on Fantasy Grounds shortly after the hardcover and softcover volumes ship. With terrific map management, full suites of digital tokens, pre-set monster stats, and more, virtual tabletops make it easier than ever to just sit down and play. The VTT packages for the Old Margreve will be extensive and include everything provided in the print edition—plus the flexibility and speed of online play. We're partnering directly with Roll20 and Fantasy Gournds, two of the leading VTT companies, to make these digital versions complete and powerful. The designers on this project include lead designer Matt Corley plus contributing designers Dan Dillon, Jon Sawatsky, James Introcaso, and Wolfgang Baur. They build on earlier Margreve work by Richard Pett, Ben McFarland, Tim & Eileen Connors, Dan Voyce, Michael Furlanetto, Wolfgang Baur, and others. Shipping costs from the US to anywhere outside North America have risen sharply in recent years, so we are once again partnering with groups in Canada, in the EU, and likely in Australia (depending on the volume of backers there), and if so then Kobold Press will pay customs and import duties for those packages. Our best guess for those Canada-friendly and EU-friendly costs right now are roughly $22 shipping for Canada and roughly $30-and-a-bit for shipping to the EU. We do not have an Australia estimate yet.